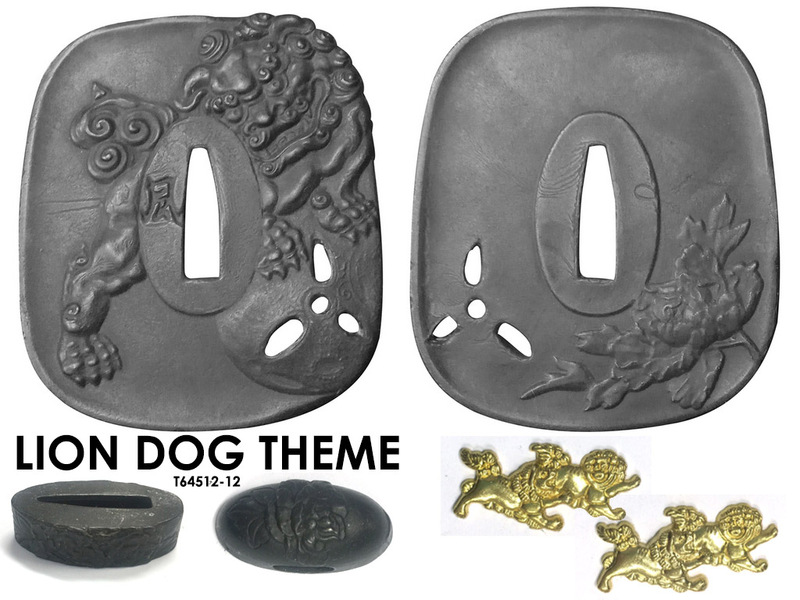 1060 Carbon Steel, Differentially Hardened Katana with Real Hamon, Steel Fittings and Your Choice from 5 different koshirae sets. Amazing value for money. FREE 1045 Tanto in your choice of color with every order! This is an unprecedented deal on a solid 1060 Carbon Steel blade with natural hamon, clay tempered and about as traditional as they come. 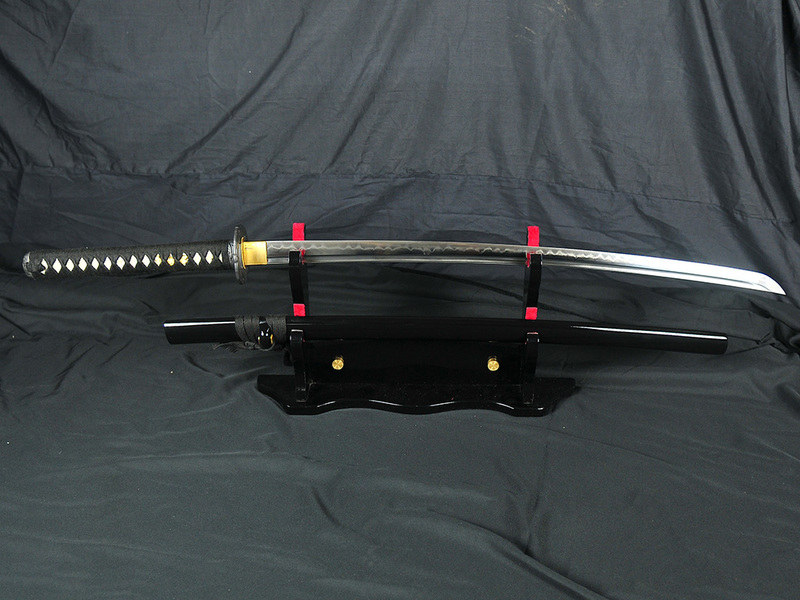 1060 Carbon steel is a popular steel for fully functional Japanese style swords as it is perfectly balanced between hardness and durability - and this becomes even more evident when the edge is hardened in the traditional manner to around HRC 60 and the spine left with shock absorbing qualities at around HRC 40. 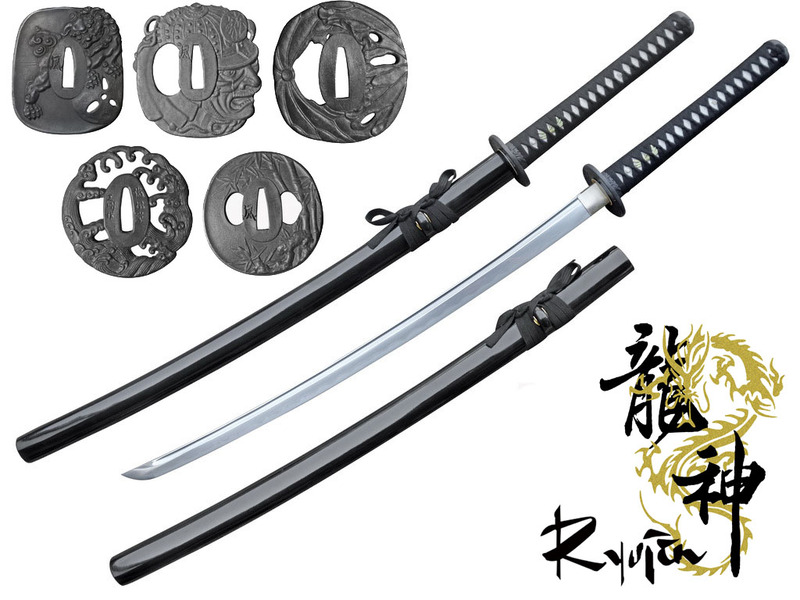 Most 1060 Carbon Steel blades on the market are priced between $250-$400 depending on the level of detail and the quality of the fittings - THIS sword has fittings and blade that put it firmly in the $269-$299 price range, but thanks to the buying power of Ryujn and their razor thin mark ups, it is available at the same price as what most others sell 1045 carbon steel blades with cheap zinc aluminum fittings for, making it one of the best value buys to ever hit the sword market. 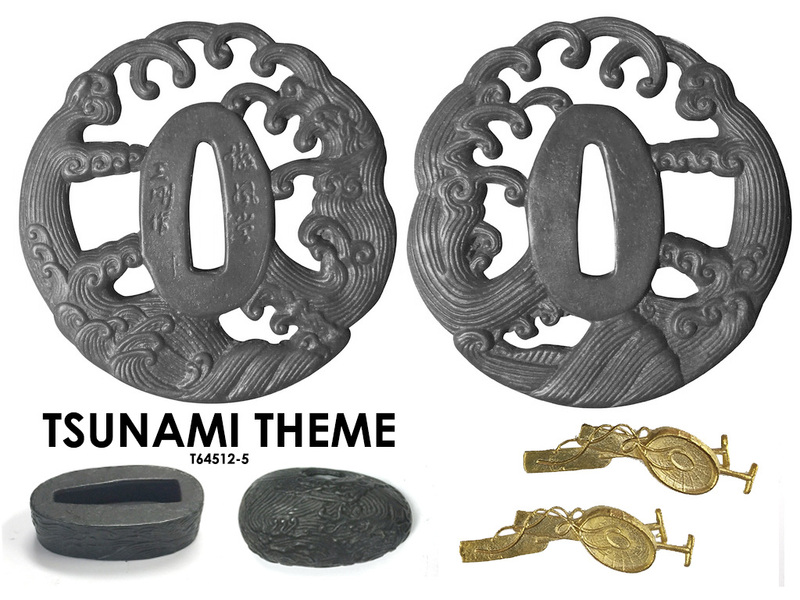 Designed for the dojo or the backyard, these swords come with the most traditional style fittings from the Edo period when all loyal subjects to the Shogun were expected to bear a sword with Black ito, black saya and white rayskin and regulation length blades - and as such is a true Samurai's weapon. 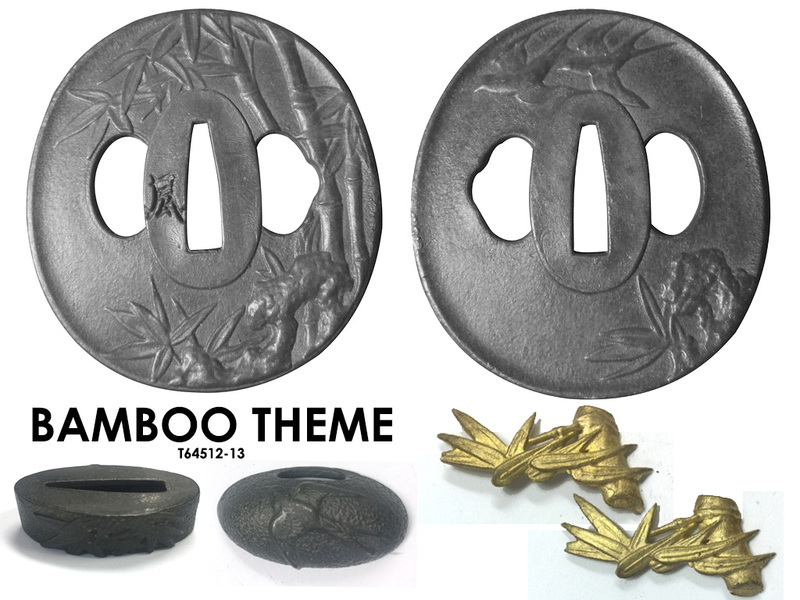 But the fittings are not just traditional, where most other swords at this price point only have a 1045 carbon steel blade and zinc aluminum fittings, the Ryujin 1060 DH swords have solid iron fittings in 5 different themes: Tsunami, Lotus, Kabuto (Samurai Helmet), Temple Guardian or Bamboo Tiger - and each fittings set also includes iron fuchikashira and a menuki handle ornament designed specifically for that particular theme. Don't make the mistake of thinking these swords are just pretty ornaments - these are serious, practical blades that are surprisingly robust yet traditionally constructed and at our special introductory price, are some of the best cutting swords available anywhere near this price point. Differentially hardened fully sharpened 1060 Carbon Steel blade with real hamon. 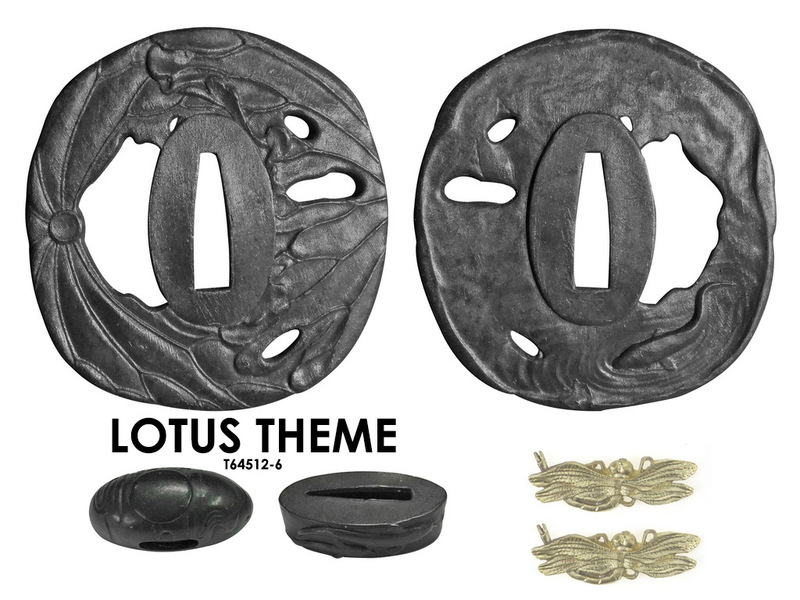 Blackened stainless steel fittings with your choice of 5 different themes. 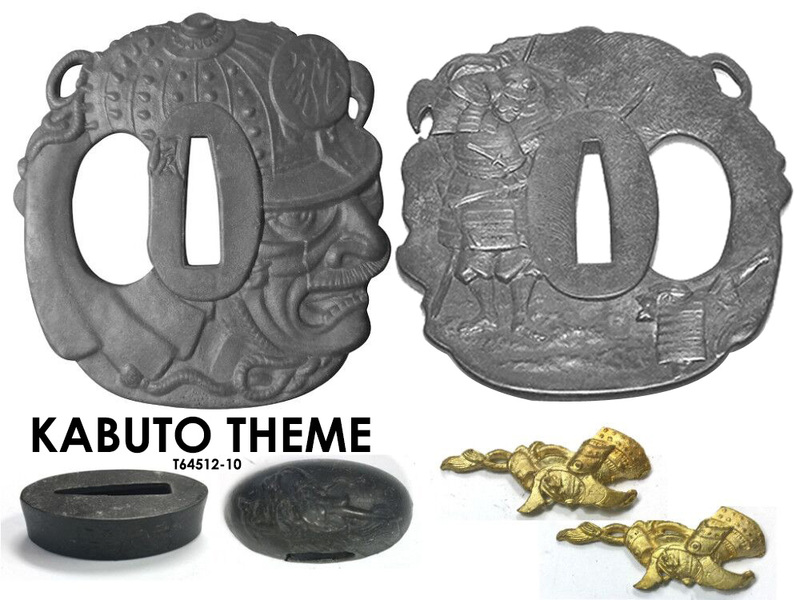 Brass Habaki, Seppa and Menuki. Glossy Black Saya, Black cotton ito wrap over real rayskin. I bought this sword for my teenage daughter. She had been bugging me to buy her a "real" sword for some time, and given a teenager's interest span, this was the ideal price point. The sword arrived today and I'm totally impressed by the quality and value. This is a well made, no nonsense sword. We are very happy with SBG and this purchase.